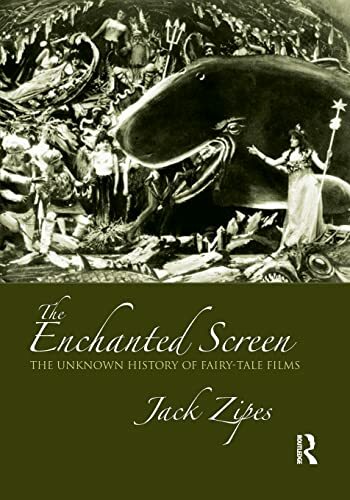 The Enchanted Screen: The Unknown History of Fairy-Tale Films by Jack Zipes. Published by Routledge 2011. Paperback in very good condition.Offering readers a l, comprehensive look at the rich history of fairy tales and their influence on film, complete with the inclusion of an extensive filmography compiled by the author. With this book, Jack Zipes not only looks at the extensive, illustrious life of fairy tales and cinema, but he also reminds us that, decades before Walt Disney made his mark on the genre, fairy tales were central to the birth of cinema as a medium, as they offered cheap, copyright-free material that could easily engage audiences not only though their familiarity but also through their dazzling special effects. Since the story of fairy tales on film stretches far beyond Disney, this book, therefore, discusses a broad range of films silent, English and non-English, animation, live-action, puppetry, woodcut, montage (Jim Henson), cartoon, and digital. Zipes, thus, gives his readers an in depth look into the special relationship between fairy tales and cinema, and guides us through this vast array of films by tracing the adaptations of major fairy tales like Little Red Riding Hood, Cinderella, Snow White, Peter Pan, and many more, from their earliest cinematic appearances to today. Full of insight into some of our most beloved films and stories, and boldly illustrated with numerous film stills, The Enchanted Screen, is essential reading for film buffs and fans of the fairy tale alike. "The subtitle of the book is The Unknown History of Fairy-Tale Films; what Zipes has done in this book, as he has done in all his work, is to make that history known." Jack Zipes is Professor Emeritus of German and Comparative Literature at the University of Minnesota. An acclaimed translator and scholar of children's literature and culture, his most recent books include Relentless Progress: The Reconfiguration of Children's Literature, Fairy Tales, and Storytelling; The Collected Sicilian Folk and Fairy Tales of Giuseppe Pitré; Why Fairy Tales Stick; Hans Christian Andersen: The Misunderstood Storyteller, Beautiful Angiola; and The Robber with the Witch's Head, all published by Routledge.